Contact Us at info@sunnsand.com | 800.635.0846. With over 1500 styles to choose from it is easy to Create a winning promotion with your customer's logo on a beautiful in-stock Sun 'N' Sand® handbag or hat. We offer a complete custom program that allows you to creatively market and sell your ideas and concepts to your customers so that they may effectively use them to promote their business. 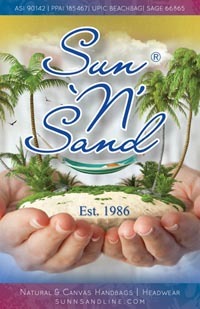 To view our full line catalogs, price lists, and product images visit our friendly promotional website at www.sunnsandline.com or Contact Us at info@sunnsand.com | 800.635.0846.